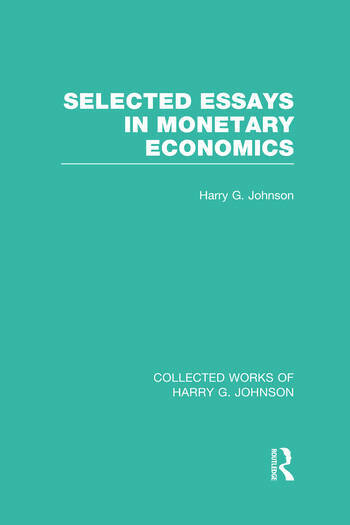 This volume consists of selected previously published key essays which have proved most useful for teaching advanced monetary economics. A short introduction was added which places the selection of essays and the issues they cover in the contemporaneous context of simultaneous high inflation and high unemployment. As relevant today as they were when they were first written, they enable the reader to anticipate intelligently what is likely to happen and why. Introduction Part 1: Reprinted from Essays in Monetary Economics 1. Monetary Theory and Policy 2. Recent Developments in Monetary Theory 3. A Survey of Theories of Inflation 4.Money in a Neo-Classical One-Sector Growth Model Part 2: Reprinted from Further Essays in Monetary Economics 5. Recent developments in Monetary Theory – A Commentary 6. The Keynesian Revolution and the Monetarist Counter-Revolution Appendix: Monetary Theory and Monetary Policy 7. Inside Money, Outside Money, Income, Wealth and Welfare in Monetary Theory Appendix: A Comment on Pesek and Saving’s Theory of Money and Wealth 8. Is There an Optimal Money Supply?